Pick of the Patch: FREE Halloween Party Printables! This Halloween, my family and I decided to take a much simpler approach to the celebration. The last few years we have lived vicariously through the babies, celebrating all the funky themed Halloween fêtes we only wish we'd had in our youth. Now, the young'n's are old enough to pick their own costumes, and definitely old enough to realize we are dressing them up in costumes from before their time. In deciding to simplify, it left a whole world of options for subtle themes. In an effort to keep it kid friendly (the kiddos are only three, after all), I made up a cute and simple set of party printables with a bit of a modern/hipster feel. And guess what? We didn't use them. I didn't even print them. That is how much we simplified this year. That being said, I now offer to you all -- free of charge -- a full set of brand new, unused party printables--still in their original packaging! The set includes tent cards, cupcake toppers, and party circles. I hope you treat (or trick!) them well. 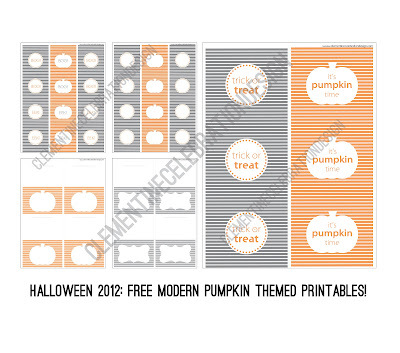 Download your FREE Halloween Party Printables here! Feel free to share photos of how you made the most of the pumpkin goodness! I love to see how you celebrate.